As reported yesterday, we left a dandelion chain out for the fairies yesterday. I didn't disappoint! 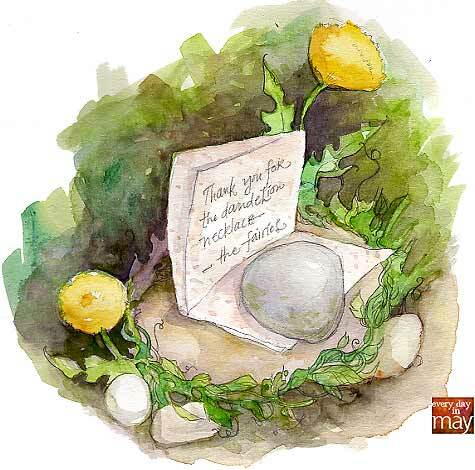 I took a small sheet of paper with flowers pressed into it, folded it in quarters, and wrote a thank you note from the fairies to leave on the rock. Weighted down with a rock, the note sat there while I gathered pale pink and deep magenta azalea branches to put in a jam jar on our dining room table. I walked Sophie home from school and suggested we go check the rock before we went inside. She was thrilled, and it was really sweet to see, she read it over and over and showed it to Peter and Angela when they woke up from their naps. We tucked the note under a beautiful statue of a sleeping fairy Snowflake gave to us.